Do Electric Toothbrushes Work Better? My dentist recommended that I get an electric toothbrush a few years back, but it never really stuck. Recently though, I dusted it off and brought some new brushes for it. As it turns out electric toothbrushes are signficantly more effective that manual toothbrushes. 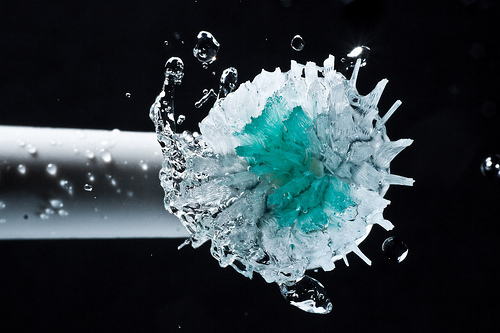 One review analyzed the results of 56 studies investigating the difference between electric and manual toothbrushes. The researchers found that electric toothbrushes reduced plaque by 11% between 1 and 3 months use and by 21% after 3 months use. Gingivitis was reduced by 6% between 1 and 3 months use and by 11% after 3 months use. Rotation oscillation brushes (circular brushes that rotate in one direction then the other, like the one pictured above), were found to be the most effective. Good oral hygiene, through the removal of plaque (a sticky film containing bacteria) by effective toothbrushing has an important role in the prevention of gum disease and tooth decay. Dental plaque is the primary cause of gingivitis (gum inflammation) and is implicated in the progression to periodontitis, a more serious form of gum disease that affects the tissues that support the teeth. The build up of plaque can also lead to tooth decay. Both gum disease and tooth decay are the primary reasons for tooth loss. You can get by fine with a manual toothbrush. But, if you are having some dental problems or don’t mind ponying up the extra money, you should be better off with an electric toothbrush. Specifically, go with a rotation oscillation brush. Let us know how it goes! If you’re looking for more advice on oral hygiene, why not consult with your dentist. Those in Luck, Wisconsin, and the surrounding area can visit Luck Dental Clinic for an appointment. Yaacob, M., et al. “Powered/electric toothbrushes compared to manual toothbrushes for maintaining oral health.” Health (2014).